Colorful photos of more than a dozen insects and galls found on oak trees. 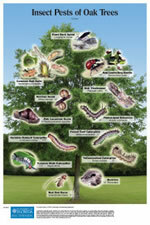 Wide variety of insects includes caterpillars, beetles and scales. Size information completes this full-color, 12" x 18" poster.